I suppose our four sibling ‘kittens’ should now rightly be referred to as ‘cats’ since they will reach the age of one year old on May 2! 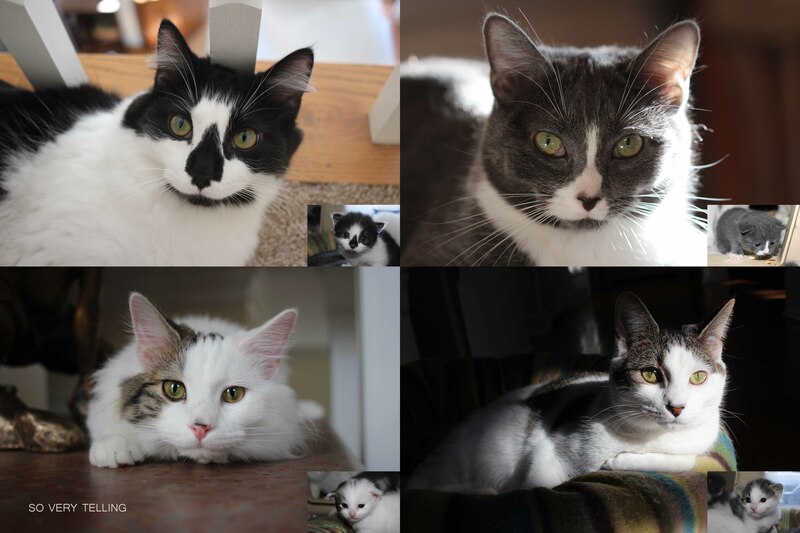 After adopting them in early July, they have been a daily joy. Happy Birthday Pepe, Milo, Prissy and Misty! I am a wife, mother of an adult son, writer, photographer, artist, and past IT professional -- just sharing my journey! © SoVeryTelling.com, . Unauthorized use and/or duplication of this material without express and written permission from this blog’s author and/or owner is strictly prohibited. Excerpts and links may be used, provided that full and clear credit is given to SoVeryTelling.com with appropriate and specific direction to the original content.